"Data is the new gold" comments Tom Griffith, one half of the duo who founded Australian business success story, Emma & Tom's. The business has been through a huge growth journey, supported by clever strategies and the right business software that provides the real-time data needed to stay agile and clearly see the business challenges and opportunities. 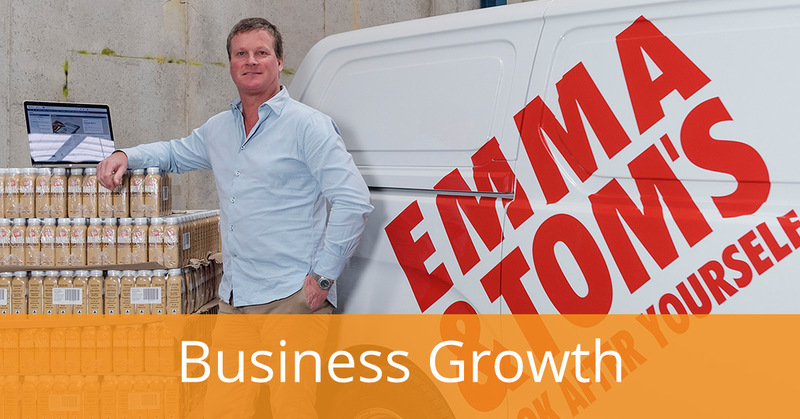 Hear Tom's insights about business growth, how they've seen continued success, and why having the right cloud ERP system in place can make all the difference. See the video interview below with David Koch from Kochie's Business Builders. David Koch: Hello, and welcome to Ask Kochie on this Monday afternoon at 12:30. We're here to take your small business questions or personal finance questions for the next 20, 30 minutes or so. And I've got an old mate with me. I always have regular guests, and he's almost part of the Kochie's Business Builders family. Tom from Emma and Tom's. And we're being sustained by your nectar today. David Koch: How are you, mate? Good to see you. Tom Griffith: I'm great. Yeah, very well. Thank you. Obviously, we enjoy summer. We tend to sell more drinks in summer time. It's going good, thank you. Tom Griffith: Emma's very well. She's been up in China and up here seeing Woolworth's. We're like ships in the night at the moment. David Koch: Yeah. So for those people who don't know the back story to Emma and Tom's, tell us about how you started. Tom Griffith: Look, we started in 2004. We launched four bottles of super-premium fruit juice out of a van ourselves in Melbourne and Sydney. And that's grown from having one caster being our distributor and two vans in those days to now having a full range of healthy drinks and snacks. We've got 45 vans in Australia. We've got about, probably we're sold in about 6000 outlets. And we're now enjoying growing export sales in China. David Koch: It is extraordinary, because when we first talked to you, I think it was in the markets. David Koch: I think, wasn't it? All those years ago. The growth has been phenomenal. What have been the challenges for you of meeting that growth? Tom Griffith: I think it's just about plugging away. You've got to be really tenacious. Emma's good at that. I'm pretty [leathery 00:01:50]. You just need to knock down doors. Tom Griffith: Yeah, you just gotta keep on going. I mean, no one's going to help you, no one really cares. You just gotta keep on speaking for yourself, fighting the fight. And there's no big, big win. There's just slow progress. And it takes time to launch products and get them going. David Koch: See, I get to look at a lot of businesses that go through these massive growth phases. Often, it's their undoing, because they can't cope with growth, they can't cope with the management side, the staff side, and the systems side of making sure that yes, you're growing, and that's terrific, big pat on the back, but unless you've got the back end right, you're going to fail in the future, aren't you? Tom Griffith: Yeah. We were at this stage at one point with a very poor system, where we were hearing about upsets in April, for example, sometime in September. And we had spreadsheets and everything was band-aided. It just wasn't right. And we should have moved really across to what our current platform is, being NetSuite, two years earlier. It's like all these things, I should've done that earlier. David Koch: So, how did you get the right systems in place? Tom Griffith: We looked around, of course. I did most of the shopping. And we settled upon NetSuite as a no-brainer to us. David Koch: Why? What'd you look for? Tom Griffith: Because it was an ERP system, it was fairly intuitive, it didn't require a lot of IT consulting spend. And you hear people putting in a new system and then having to chuck couple hundred thousand dollars at it. As a small business, it's tough. David Koch: And that's often why people don't change, because they think, "God, it's going to cost me the earth, and who do I trust." Tom Griffith: We find it doesn't cost an awful lot to run, everyone's on it. For example, we've got a great new CFO in the chair in April, and he didn't cough. Just into it. David Koch: Right, right. So, getting the right system but also getting a good CFO as well who understood the systems and how to implement it? Tom Griffith: Yeah. I mean someone said recently that data is the new gold. And we just got more money out of the NAB, debt finance. And they put in a very onerous list of requirements. David Koch: You got money out of a bank? Tom Griffith: Post royal commission. David Koch: My God, how? Tom Griffith: They'd been, "For the times that matter." And we said it matters now, it won't matter in a years time. We can tick the boxes. They gave us an onerous list of requirements of information. And via NetSuite we can just basically cut and paste everything for different ways, be it by state, by product line, by SKU, you name it. And we furnished with all the information in under a week and got approval. David Koch: Right. So the access to data isn't just about good management it's also being able to get good finance as well because a financier has confidence that you've got all the data available, that you're on top of the business, you know exactly what's going on. Tom Griffith: Yep. They know that the data is accurate and timely. And that's the bottom line. Tom Griffith: All cloud based. I mean, we've got 45 vans on the cloud. Both via NetSuite and by GPS tracking, you name it. So we can look at anything, anytime, anywhere, and it's up to date. And we now close off our monthlies. David Koch: What do you mean it's up to date? Tom Griffith: Well, it's live. So I sell one of these in a shop in Barangaroo and our system adjusts that minute. David Koch: What, and goes through your dashboard? Tom Griffith: But of course all of our dashboards are different depending upon whether we are running interstate, or running a team from Melbourne, from head office in Melbourne. Say Gab in Brisbane has different information to what I would see in Melbourne, or Nick would see in Sydney. David Koch: Yeah. But also having a perishable good, that must cut down your wastage as well. Does it? David Koch: That sort of inventory control. Tom Griffith: We've had a group in from a NetSuite plugin called NETSTOCK. It's an inventory management system so it helps us predict reorder times. Obviously if you've got 60 SKUs being manufactured in about six different plants using about 500 inputs, you've got a lot of things flying around and there's no point turning up to me and saying, "We've got to make Green Power today, but we made a mistake and we're out of spirulina." It doesn't get made. And that cost you money. David Koch: You're a great lesson for ... And that's why we love coming in and checking back with you all the time on the show and our different media products here at Pinstripe. It's a great lesson to all businesses isn't it? It is, what you said before, data is key to run the business. But it doesn't have to cost the earth to have the systems to provide you with that data. So you're blowing the myth out of the water. Tom Griffith: Our IT cost is a absolute fraction of our turnover. You hear that the metrics of what you should be. For example, they always say insurance will be between .7% and 1% of your turnover et cetera. Our IT spending is right down the bottom end of the IT scale. David Koch: And you're just getting that sort of data coming through, but it also helps you overseas. David Koch: You were saying, you're exporting to China. Where else do you export now? Tom Griffith: We export to Dubai, Jordan, Malaysia, Hong Kong, Singapore, and of course China we'll be going in to Shanghai and Beijing, and that's evolving rapidly as well. David Koch: Right, okay. How did you choose those countries? Tom Griffith: We chose them via looking around carefully for the right partner. We believe it's all about people. Even our Australian relationships have got quite some longevity. We like partnerships and our relationships. So for example, the family who run the distribution business in Dubai, they're now our sort of Middle Eastern importer. David Koch: So he does Jordan and all that. Tom Griffith: And Dubai, and Jordan. Our distributor in Shanghai is also now our Chinese importer. So once again because it worked well with those guys. And now we're doing more online too, so that requires once again more integration, you see. Because we're working on obviously increasing online sales. David Koch: Okay. And that's even more important to have a right system that can cope with that overseas expansion as well. Tom Griffith: That's right. So we can, obviously once we get sales going up big enough, we plug in the online store to NetSuite, and that's a very simple process. And of course then that deals with all the different foreign currencies, the different shipping rates, everything just gets plugged in again. Because the thing we've found with NetSuite, because, I think I'm right in saying, there's been 700 thousand users, if there's a problem it's already been thought about and solved. So there's no problems. David Koch: And that's the beauty of it. Tom Griffith: And they update basically offline on a weekend. There's never any disruption due to system issues. David Koch: It's a great story. Great advice. Hey, if you want to benefit from that advice, there's a link. Download the Small Business Playbook there on the Facebook page and you can get lots of detail of what Tom has been talking about. Let's take some questions, do you reckon? From the audience. Tom Griffith: Sure. Love to. David Koch: Send your questions through on Facebook and we'll answer them. Anything to do with small business. Zac has been going through it, Zac. Zac: We have a question from Jane. She asks, "Dealing with fresh produce, reporting and forecasting and visibility across the business must be very important. How has NetSuite helped?" Tom Griffith: Yeah, fresh is challenging. We call it the risk of real. Because obviously there's no preservatives or stabilisers or colours or anything. You're reliant on just the real ingredients. So we have somebody in Melbourne whose title is Production Planning and Procurement. And Ingrid is sitting on our stock everywhere, because of course there's no point in coming to me and saying I've got a pallet that's got four days to use by sitting in Sydney when frankly we could have shipped it to Melbourne, or filled a gap somewhere else two weeks earlier. So it's all this alert reporting which helps enormously because you can waste a lot of product very easily, yes. David Koch: It's like you were saying before, when you're making the Power Juice and you've run out of spirulina it holds up the whole process. Tom Griffith: That's right. Also in the retail industry, in the sector, if there's a space has not been taken by you, somebody else very quickly occupies that spot. You lose your spot. David Koch: Right, okay. So it really does cost you a lot of money. Alright, let's take another question Zac. Zac: We have a question from Luke. He asks, "Hi Dave, just wondering what your thoughts are on operation from a service/virtual office, since the typical corner stores are fast disappearing. What's your take on this, and how do you feel it could be done for a real estate business? By the way, Emma and Toms is a perfect example of a true success model. Hats off to you." David Koch: So the question was about the virtual assistance, Zac, was it? Zac: Yep, and the disappearing corner stores basically. David Koch: Basically, business continues to evolve over history doesn't it. David Koch: And yes a corner store may be being replaced by online sales. How are you seeing the market? Tom Griffith: He was talking about real estate, and we all know those big brands that are kind of at the stakes where you can't talk to anyone. And it's very annoying and frustrating, but they get by with it because they've either had billions of dollars in funding they can afford to waste or they've got systems that are so elaborate they get over it. But I still think, and this has been very evident recently in Australian politics, people like the personal touch. So you've got to actually override that disability of not being present. David Koch: But also, don't you think it's ... A lot of small business owners, I think, get sucked into this view, "Oh, people coming and disrupting my model, it's bad news for my business." It's not the disrupters coming in and affecting your business, it is your customers who are disrupting your business because they're actually seeing a model by somebody else that they prefer. So what you've got to do, I think, as a normal real estate agent is to say, some of my customers want the personal touch, some of my customers just want to go online and see videos, some of my customers want to come to an auction live, others don't. So you've got to cater for all of that. I don't think in this day and age you can say, I'm only a bricks and mortar business, or I'm only a digital business. If you're a bricks and mortar business and some of your customers want digital you've got to provide it. That's the new way of doing business. Don't you reckon? Tom Griffith: I would agree. If you're not on social, and hey why wouldn't you be, it's free, your competitor is. That's the point. David Koch: Yeah. How do you use social in the market? Tom Griffith: We use Instagram a lot to try and promote the online store. We use Facebook more for newsworthy items. Like we had to announce there was an increase in the price of our orange juice, and I wanted to explain why because of the, in that case, there was a very poor crop in Australia and vast increased whole fruit sale for China. So we explained that. We don't use Twitter. I find Twitter would only get us into trouble. David Koch: You can't trust yourself on Twitter. David Koch: You hear about it. Tom Griffith: Occasionally if one of our vans does something someone doesn't enjoy, that's up online in about one minute. So we're very on to it, and we're highly aware that you need to react. We try and get complaints taken offline. And I do it personally so the person feels they've had proper [inaudible 00:13:39] to their issue or complaint. People are very quickly online rather than ring us up personally. And that's a danger. That's the trend so you've got to respect that. David Koch: Yep, absolutely. Alright, next one Zac. Zac: We have a question from Nate here. "What's your best advice for someone considering scaling up?" Tom Griffith: Ensure you can afford it. Because there's no point getting half way and running out of money because then you've lost a lot. So that's dangerous. Secondly, ensuring you have the support, once again, of your bank and your suppliers. We were only last week locking the supply from one of our plants, to make sure that they were safe. And we went out and eyeballed them. Also, I think you need to innovate. And if you don't innovate today, you're dead because if you're not doing it somebody else is. Or they'll copy you in ten minutes time. And I think also you need to be aware of seeing how it will look in five years time. Because it's not just a job you can leave. You're there, and it might take you five or ten years to get to where you want to target. So it's about the grind. David Koch: And also, I always think as the founder it's understanding what you love doing, what you're not very good at, and admitting that to yourself and getting other people to come in and plug that. Sort of your earlier comment on your CFO who was just changed the business forever. Tom Griffith: Better for sure. David Koch: Yeah. But it's your realisation that you need someone like that, and finding the right person for it must be key. Tom Griffith: That's right. I mean, even down to our sales staff. I had one very poor performing sales guy, actually in Sydney, quite some years ago. I was paying him money and he was losing us customers. So I'm paying him to actually make us go backwards. So you've got to be sort of ... it takes constant curating with everything. You're looking at ... and being critical of your model. Because we weren't critical of our model and we were doing some things wrong we didn't pick up on soon enough, and that loses you money. We weren't taking advice. Take advice. We're always now taking advice. It wasn't in the early days because we were arrogant, we just didn't get to it. And no one, once again, gives you the silver bullet, but you learn a little bit from everyone. And that helps a lot. David Koch: And that is so real. It's not as if you're arrogant, just didn't feel as though you had time to get to it. Tom Griffith: We were both having families and things. Emma had a son, I had two daughters. But I often used the running equivalent. It's sort of like running a marathon and then past a fridge. Having newborns and running a start up. So we just didn't get to it. And then we sat down one day and realised, on that instance we were churning our customer base at 30% per annum. Tom Griffith: Bang. So that evolved the whole model. David Koch: Okay. Alright, Zac, another question? Zac: I think we're done with the time actually. We're just out. David Koch: Oh, yeah. We're just out of the Facebook time now, coming up to the end of it. Tom great to see you again. David Koch: Any new lines coming out, or any new products? Tom Griffith: Yeah, we have. We've just released a whole range of protein balls. They're delicious. And they're going out into retail right now. Our new pressed juices are going into Woolworths. So that's been a success. And we've got constant NPD, or new products being developed. Kombuchas have just come out. So we're nonstop. David Koch: Big focus on China, so see you for the Port Adelaide AFL extravaganza in Shanghai in June. Tom Griffith: Love to, good. David Koch: Perfect. Alright. That's it for us. See you next time for Kochie's Business Builders. Interested to learn how a cloud-based ERP system can support your growth and boost business performance? Start with your ERP Buyer's Guide to learn what to look for in an ERP system, how to compare solutions, and how to find the right fit for your business needs.